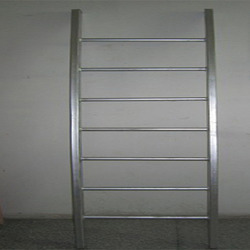 Our firm specializes in offering an excellent range of Scaffold Ladder. 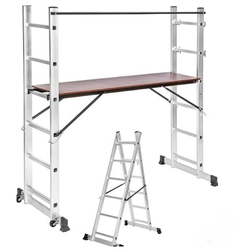 These ladders are used for climbing up to a certain level for inspection and approval of a particular task performed. This innovative range of ladders is widely demanded in various industries for meeting diverse applications. To maintain industry defined quality standards, the entire range is manufactured using quality proven a raw material and cutting-edge technology. Also, the entire range is examined properly by our quality controllers upon distinct parameters of quality. Aiming to satisfy our clients, optimally, we provide our clients with a quality approved array of Steel Ladder. The offered range is designed by our skilled professionals, using optimum quality raw material and latest technology in accordance with the specifications and requirements of our clients. Furthermore, the entire range is well checked against various quality parameters to ensure its quality attributes. Our offered ladder can be avail from us at market leading prices. Looking for Steel Ladders ?